Anti-client law complaints quango SLCC attempts to keep new Master Policy research secret. SECRET new research being carried out by the anti-client Scottish Legal Complaints Commission (SLCC) into the notoriously corrupt Master Policy & Guarantee Fund client compensation schemes operated by the Law Society of Scotland is so secret the public and media are being shut out of scrutinising the long running ‘half-hearted’ attempt by Scotland’s hapless regulator of complaints against the legal profession to fulfil a pledge in laws created at the Scottish Parliament in 2007 to investigate & oversee growing numbers of claims lodged by ripped-off clients for damages against hundreds of negligent, dishonest & ‘crooked lawyers’ in Scotland’s legal profession. Master Policy research secrets withheld by ‘independent’ law quango SLCC. Requests made to the SLCC under the Freedom of Information (Scotland) Act 2002 for more details on the nearly three year ‘ongoing’ research being carried out by the SLCC have resulted in scant release of information to the public, who are supposed to be the target of secret questionnaires, the wording of which has been the subject of heated arguments & debate within the SLCC & the Law Society of Scotland for well over a year. The SLCC have even refused to reveal how the questionnaires are to be released and what criteria is being used to select subjects from the many members of the public who have attempted to lodge claims against the Law Society of Scotland’s Guarantee Fund & Master Policy. Something to Hide ? Scottish Legal Complaints Commission’s new Master Policy Research targets 657 claimants but the forms will be handed out by Marsh ! 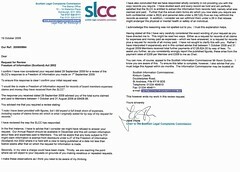 Little has been revealed of the new research in the releases of documents from the Scottish Legal Complaints Commission although one snippet of detail reveals the “SLCC to arrange for hard copies of the 657 questionnaires to be given to Marsh to send out to claimants.” with all other details from the key documents REMOVED. One of the few things to be revealed by the SLCC is this latest piece of research into the Master Policy is being carried out by Professor Frank Stephen of Manchester University’s School of Law, who co-authored the 2009 report on the Master Policy which documented client suicides and refusals by the Law Society of Scotland & US insurers Marsh to cooperate with the investigation. One MSP who studied the SLCC’s highly censored release of information queried why there was apparently only one member of the University of Manchester law team mentioned in the new survey where in the earlier 2009 report, there were two. Secret briefings between the Law Society & SLCC over the Master Policy will remain secret for now. Even briefings between the SLCC & Law Society of Scotland were deemed so sensitive & so secret due to the intense corruption already revealed within the operation of the Master Insurance Policy that details of lengthy SLCC-Law Society meetings were also censored for fear of revealing bitter arguments & heated debates over demands from the legal profession and the insurers the research should not touch on key areas or cover some of the worst examples of claims already revealed in the 2009 report which documented clients who had committed suicide after being harangued by the legal profession over their claims against the Master Policy. The SLCC’s intention to research claims made against the Guarantee Fund, a fund operated by the Law Society of Scotland which ‘requires’ all solicitors to pay into each year to cover the cost of ‘dishonesty’ in the legal profession where clients funds are fleeced or embezzled by their solicitors has also hit trouble, with the legal profession utterly resistant to any outside scrutiny of the large amounts of claims being made to the Fund, many of which date back over years, resulting in even more financial hardship to clients who have been financially ruined by their lawyers. 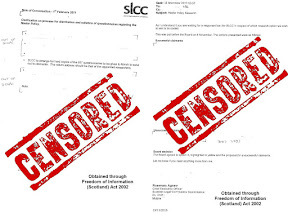 Again, the SLCC heavily censored the information regarding their attempt to investigate the Law Society’s Guarantee Fund, and most documents disclosed under Freedom of Information laws suffered severe censorship as can be seen below. Something more to hide : Scottish Legal Complaints Commission’s Guarantee Fund Research is so secret clients of crooked lawyers should not be told about it. A senior official from one of Scotland’s consumer organisations branded the SLCC’s investigations into the Master Policy & Guarantee Fund as “appalling” and claimed the law quango was trying to avoid its responsibilities to monitor claims to the Master Policy & Guarantee Fund, duties assigned to the SLCC by the Scottish Parliament in sections of the Legal Profession & Legal Aid (Scotland) Act 2007. One client told how he ended up falling victim to what he called “a six year nightmare which tore his family apart” after he tried to claim compensation for the loss of over £120,000 & property titles to a crooked lawyer who still works and has connections to several Council members of the Law Society itself. Law Society officials linked to suicide of client who claimed against the Master Policy. The suicide of one client who had dealings with the Master Policy, is apparently linked to senior officials at the Law Society of Scotland itself, who, when approached by the client to handle a complaint against his solicitor who had made major errors in handling legal business, recommended to the now deceased client he approach a well known firm of solicitors to sue his original solicitor and pursue a claim against the Master Policy for negligence. However, what the client did not know was the law firm which the now promoted Director of a department at the Law Society had recommended he approach, actually represented the Legal Defence Union, which exists to defend solicitors against both claims & complaints from clients, and who are involved in defending solicitors against over two thirds of the thousands of complaints made annually against lawyers by members of the public in Scotland. The client, a farmer and co owner of a business, went onto unknowingly engage the law firm recommended to him by the still serving senior Law Society official, however, unsurprisingly, little or no progress was made over a lengthy period of time on the client's claim against the Master Policy, which in itself, caused severe stress and depression to the client and his family. Matters reached the stage where the law firm, recommended to the client by the Law Society itself had done little on the case, and offered no hope of a just & fair resolution to the huge losses caused by the client's original solicitor, one evening, not long after yet another unsuccessful meeting with his solicitors, the client in question had reached a point of such depression, he committed suicide at home using a shotgun, leaving his widow & children. Several days after the client’s suicide, the same Law Society official who has been in charge of regulation for almost twenty years and who had recommended the law firm which had done nothing to proceed the deceased client's claim and take the original 'crooked lawyer' to court, wrote to the widow of the victim and callously informed her she had two weeks to make a complaint to the Law Society or she would be time barred. The case itself, was investigated by the then Scottish Legal Services Ombudsman Linda Costello Baker, in 2001, who found the Law Society of Scotland had failed the deceased client and ordered they re-investigate the complaint. The Law Society then proceeded to investigate the complaints again, however reaching the same conclusions, which prompted the widow of the deceased client to return to the SLSO, Ms Costello Baker, who again investigated in 2003 and judged the Law Society had failed once more. At least two other suicides directly associated with clients dealings with the Master Policy are known, where in both cases, clients appeared to have been put under intolerable pressure, delay, deceit and intimidation by lawyers, the Law Society itself, and the insurers to the Master Policy, that the result of the entire process was to cause the claimants to end their lives after breaking under the strain of dealings with the apparently deadly Master Policy insurance scheme. Further excerpts from the Manchester University report into the Law Society's Master Policy & Guarantee Fund show the intolerable strain clients who attempt to claim against their 'crooked' solicitor have to endure : Claimants "described being intimidated, being forced to settle rather than try to run a hearing without legal support, and all felt that their claims’ outcomes were not fair. Some claimants felt that they should have received more support, and that this lack was further evidence of actors within the legal system being “against” Master Policy claimants. Judges were described as being “former solicitors”, members of the Law Society – and thus, against claimants. Some described judges and other judicial officers as being very hostile to party litigants." SLCC Chair Jane Irvine ‘well aware of long running problems & corruption at the Law Society, Master Policy & Insurers’. Insiders at the Scottish Legal Complaints Commission claim Jane Irvine, the current SLCC Chair “is well aware” of the suicide case and many other difficulties encountered by clients attempting to register claims against the Master Policy & Guarantee Funds, many of which were brought to the attention of Ms Irvine and also her predecessor at the Scottish Legal Services Ombudsman, Linda Costello Baker, yet the SLCC has chosen to do nothing on its monitoring role after three years of operation and several of the SLCC’s board members now appear to exhibit intense personal prejudice against clients who dare attempt to claim back financial damages inflicted on them by their legal representatives. Law Society’s manifesto for lawyers says public should know more about the law, less about those sitting behind a lawyer’s desk. THE current, embattled President of the Law Society of Scotland, Jamie Millar who has been caught up in various arguments with leading west coast lawyers over the manipulative control freak nature of Scotland’s governing body for lawyers yesterday claimed Scots consumers should be given a wider knowledge of the law and how it works, although perhaps not enough knowledge so that consumers might end up choosing not to waste a few thousand pounds with a solicitor, and instead go it alone in courts on small scale legal disputes, thus depriving the legal profession of millions of pounds of lost business. Perhaps unsurprisingly, the Law Society’s plans for making changes to the curriculum in Scotland’s secondary schools will ensure it and various business models attached to the Scottish legal profession will control how law and the legal system is taught in Scotland’s schools. On the issue of Access to legal services, advice and representation, the Law Society claims in its manifesto that it believes that access to justice remains a key element of a free and fair society, yet in reality, the Law Society of Scotland holds world records for opposing many reforms to Scotland’s legal system, from the raising of small claims ceilings to class actions, and opposing the introduction of independent regulation of legal services even at the point of legal threats to the legislative process in the Scottish Parliament itself. The Law Society also notably opposed the introduction of McKenzie Friends (lay assistants or courtroom helpers for unrepresented party litigants), which had been kept out of Scotland for some FORTY YEARS by the legal profession, who feared McKenzie Friends would chip away at lawyers dominance of access to the courts. On the issue of a civil justice system that meets the need of society, or perhaps the Law Society means, “meets the needs of the Law Society rather than the public”, the Law Society says it believes that urgent changes are required to the civil justice system to make it more efficient and ensure it better meets the needs of a changing society. Yet the many urgent changes proposed by the Law Society have for years, been stifled from introduction by its own members and by Law Society lobbying against reforms. The topic of “Good Legislation” again meets with similar calls for reviews, evaluations & calls for more consultation with the public & of course the legal profession over the passing of legislation. Obviously the Law Society might be worried some new legislation may slip through putting consumer rights ahead of the perceived priority rights of members of the Law Society of Scotland, something the Society could never allow to happen of course. And finally, to cap it all, the topic of “Sustainable Economy” puts the Law Society of Scotland and its members at the heart of (don't laugh) playing “an integral role in Scotland’s future economic success”, presumably by ripping off taxpayer funded legal aid and clients whenever possible. He continued : "From those we spoke to, there was a strong feeling that for the legal system to be effective there had to be a better understanding and awareness amongst the general public of how the law and justice system operates not least to try and grow a greater sense of citizenship in our society and our democracy. That is why we have called for this in our manifesto. Public education is not simply a job for government and our parliamentarians however. The Society, as well as the wider legal profession, has an important role to play in partnership with others to increase awareness. The Schools Law Web is one example of where stakeholders have recently come together to successfully provide legal education for schools." Interestingly, the Law Society had earlier this year, interdicted attempts at the Scottish Parliament to open up the issue of legal education in Scotland’s schools, preventing open debate on suggestions that teachers would be better placed to teach law to kids in schools, rather than costly business models connected to the legal profession itself. On this point, Mr Millar said: "Increasing the public's knowledge and understanding of the law would have significant benefits not just for the legal system, but for society as a whole. It is something that we will continue to push for during the election campaign and indeed once a new government is in place." Sure thing Mr Millar. You could draft in crooked Scottish Borders solicitor Andrew Penman to teach pupils of the importance of falsifying file notes, how to deliberately deceive banks, and the Inland Revenue & mishandle wills, while also sending in John G O'Donnell & Catriona Macfarlane to teach honesty, along with the Legal Defence Union to teach to get out of being held to account for alleged misuse of taxpayer funded legal aid. So, now readers know what Scotland would look like if it was run by the Law Society of Scotland. The Law Society’s proposals have been rounded on by consumer groups as little more than an attempt to control the extent of, or even delay many of the reforms already suggested by the Scottish Civil Courts Review, undertaken by the Lord Justice Clerk, Lord Gill, who branded Scotland’s civil justice system a Victorian model unfit for purpose. SLCC ‘little more than a duck-out house for law complaints’ as solicitors clients forced to foot huge salaries & expenses for do-little law quango. EXTRAVAGANT PAYMENTS & rocketing expenses claims of frequently flying board members at the anti-client Scottish Legal Complaints Commission (SLCC) are revealed today for the firs time in their full detail after a decision from the Scottish Information Commissioner Kevin Dunion forced the ‘do-little, do-nothing’ law complaints regulator to disclose the actual claims requests submitted by its board members in true Westminster MP expenses claims style, shining a light into the murky world of remuneration at Scotland’s ineffective law complaints quango. The rocketing figures of remuneration & expenses at the SLCC, which is expected to jump even higher in the next financial year after the addition of three new ‘non-lawyer’ board members including yet another soon-to-retire senior Policeman and an additional ‘lawyer-only’ board member who took the job after no one else in the profession bothered to apply, were criticised by consumer groups and solicitors alike today, as bearing little relation the reality of difficult financial times for all. Several solicitors and law firms contacted by Diary of Injustice admitted the expense to the legal profession of running the SLCC has impacted on charges for legal services in Scotland as many solicitors & law firms faced with a general reduction in business and having to deal with a complicated complaints system using the SLCC & Law Society of Scotland, have been forced to pass on the costs to consumers. Last year, the Scottish Legal Complaints Commission gave two different figures for expenses claims in an effort to mislead the media. The first figure offered up for their 2008-2009 financial year was a meagre £6408.96 yet after further investigations & tip offs, the SLCC was forced to correct the suspiciously low figure and reveal a whopping £128,624.00 had actually been paid out to its board members, many of whom have several other jobs and positions on other taxpayer funded quangos. The now former SLCC Chief Executive Eileen Masterman at 70K a year was named in a survey as one of the highest paid quango Chiefs in Scotland at the time. Last year it was revealed While board members of the SLCC raked in a staggering £135,000 plus in expenses claims over the past year, and its Chair, Jane Irvine netted in the region of £308 a day, along with the now resigned due to ill health Chief Executive Eileen Masterman who earned a whopping £1350 per week. During 2009, the complaints body showed itself over the past year to be a very poor regulator of complaints against ‘crooked lawyers’, leaving many clients finding their complaints have been ‘whitewashed’ in a way reminiscent of the Law Society of Scotland’s Client Relations Office investigations, which are well known to have let thousands of crooked lawyers off the hook from even the most serious of complaints. 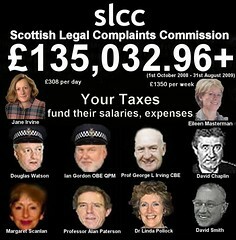 This year, in spite of the same little-work regime at the SLCC where yet again, most complaints have been passed back to the Law Society of Scotland by the ‘independent’ law complaints quango, an extra £23,000.00 seems to have been added to the expenses & remuneration totals. Slip-up or deliberate attempt to mislead ? : SLCC provided misleading information only admitting to £6k expenses on earlier FOI request. 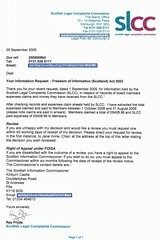 The Scottish Legal Complaints Commission had in 2009, apparently intentionally provided deceptive information to an earlier FOI request from the media over members expenses, where the SLCC claimed the total sums claimed and paid to Members between 1 October and 31 August 2009 at £6408.96. However, when quizzed further on the figures, the SLCC Chair, Jane Irvine issued a new statement contradicting the earlier FOI response on members expenses, and admitted that between 1 October 2008 and 31 August 2009 members received total further payments of a staggering £128,624.00 by way of fees, giving the following 'varying interpretation' reason for the staggering £122,216.00 error in the Commission's expenses accounting figures. SLCC Chief Jane Irvine threatened media after FOI requests for board members expenses details. After having to admit the huge discrepancies in the FOI release of expenses claims, the SLCC’s Chair, Jane Irvine, threatened to brand journalists Freedom of Information enquires as “vexatious” in an attempt to control publicity on the SLCC’s board members expenses claims habits. Ms Irvine said : "Having stated all this I have very carefully considered the exact wording of your request as you have directed me to. This might be read two ways. Either as a request for records of all claims for expenses and money paid as expenses - which we have answered, or a request for records plus a request for records of all money paid. I have not sought to clarify this with you. Rather I have interpreted it expansively and in this context advise that between 1 October 2008 and 31 August 2009 Members received total further payments of £128,624.00 by way of fees." The SLCC had previously argued the mental health & ‘safety problems’ of its board members would preclude any significant disclosure of their expenses claims. 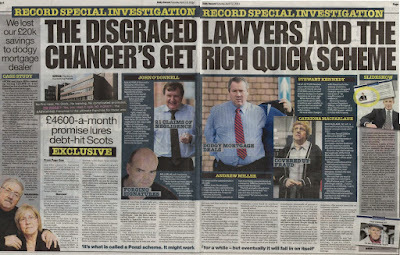 Daily Record expose of get-rich-quick scheme : Not content with one rogue lawyer, someone had to hire three. SCOTS CONSUMERS should be on the look out for too-good-to-be-true finance deals presented to them by familiar faces from the world of bankrupts & crooked lawyers after an investigation by Scotland’s Daily Record newspaper into Cost Reduction Services operated by “banned twice-bankrupt Stewart Kennedy” revealed some of Scotland’s more notorious ‘crooked lawyers’, John G O'Donnell, Catriona Macfarlane & Andrew Miller were linked to the "shady get-rich-quick scheme" based near Glasgow Airport. The alarming ease of which rogue lawyers who have regularly been identified by the media in scandals involving ripping off multiple clients again raises questions over the effectiveness of the self regulation of lawyers in Scotland by the Law Society of Scotland and its ‘front company’, the Scottish Legal Complaints Commission (SLCC). The Law Society of Scotland has unconvincingly claimed for over two decades it offers consumers & clients “ultimate protection” against Scotland’s notoriously corrupt legal services market yet the Society has binned tens of thousands of complaints over the years and allowed most rogue lawyers to escape any punishment for their crimes against clients. Recently it was even revealed the Law Society had also intervened to prevent proceedings against solicitors who stole or exaggerated their claims for taxpayer funded legal aid. The notoriously anti-client Scottish Legal Complaints Commission, nicknamed a “Front Company for the Law Society” by some msps, equally professes its resolve to ‘independently’ investigate complaints against Scottish solicitors, yet in January it was revealed the SLCC has only managed to uphold one single complaint against an unidentified solicitor in three years, while passing most cases it receives back to the unbelievably prejudiced Law Society of Scotland for yet more slaps on the wrist. However, while the legal profession’s self regulators spend more time counting their cash or slipping complaints under the carpet, certain parts of the media such as the Daily Record & Sunday Mail have again proved themselves a much more effective regulator & beacon of consumer protection by exposing the new bases & con-tricks of some of those solicitors & ex solicitors who the public should be on the look out to avoid. Here follows the Daily Record’s investigation into “Cost Reduction Services”, its owner & those rogue lawyers we now know so well. If consumers have suspicions about their lawyers or these get rich quick schemes, the message is clear, you would do a lot more good reporting your concerns to the media before attempting to communicate with the self regulators who control the legal profession. THREE rogue lawyers are linked to a firm behind a shady get-rich-quick scheme, a Record investigation has revealed. Cost Reduction Services - run by an ex-bankrupt who was accused of fraud use fake photos of "satisfied customers "and promises of £4600-a-month earnings to lure debt-hit Scots. But former staff members say the venture is a classic Ponzi scheme - in which new investors' cash is paid out to older ones with no real income being generated. The outfit is headed by self-styled finance expert Stewart Kennedy, 46, who walked away with £100,000 of his former clients' cash. Banned Twice-bankrupt Kennedy has assembled a list of suspect characters to work for the company, which is based in a part-empty office block by the M8 near Glasgow Airport. They include dodgy lawyers found guilty of professional misconduct by the Scottish Solicitors' Discipline Tribunal (SSDT), and several other former bankrupts. One boss at the firm is dodgy solicitor Catriona McFarlane, 50, who is banned from practising law unsupervised. Crooked lawyer Andrew Miller, 49, who was struck off and branded dishonest by the SSDT, was taken on as a salesman for the business. And John O'Donnell, 60, a third solicitor rapped by SSDT - is being styled by Kennedy as the firm's "court lawyer", sources say. Kennedy's business targets debt-ridden homeowners and small businesses, by cold-calling them and offering to reduce their monthly outgoings. Their "solution" involves remortgaging clients' homes or properties to free up cash for clearing other debts such as loans and credit card balances. Customers are charged £3500 in fees then offered the chance of buying £15,000 "franchises" in the business - which CRS say will involve no work but bring in £4600 a month. But insiders claim nobody could have received the promised returns. Yesterday, an expert in the franchise market said the scheme was "very suspicious" and should be avoided. Cost Reduction Services - full name Cost Reduction Services (2010) Ltd - were registered at Companies House in April 2010, contradicting claims on their website that they have been in business for 10 years. The business has no link to Surrey firm Cost Reduction Services Ltd.
And suspicions have been raised further by our findings that the firm is using an online slideshow with phoney photos to flog the £15,000 franchises. They are marketing the deal by using glowing testimonials from people they claim are happy customers. But the satisfied "franchise holders" who are shown during the 43-minute sales presentation are actually faces from random snaps found on the internet. Our investigators traced one of the individuals - who the firm claim is called Mandy - and found she is actually a Spanish woman from Madrid called Marta Balius. A second so-called customer, named as Andrew, is an American model posing as a businessman for promotional shots. The slideshow is voiced by Cost Reduction Services "franchise manager" Graham Scott, 56, from Avonbridge, near Falkirk. Like Kennedy and at least one other member of staff at the firm who claim to be able to help customers with their financial problems, Scott is a former bankrupt. In the presentation, he talks up the company's EasyEarn Franchise and promises punters a return of £4600 a month for no work. When we confronted Scott with the evidence yesterday, he eventually admitted the pictures were fake. He said: "They're just, erm, erm, stock pictures." Scott refused to answer any further questions about the featured customer testimonials. He referred all further questions to managing director Kennedy, who was discharged from bankruptcy on April 1 last year, just days before he registered his company. Former mortgage advisor Kennedy , from Quarriers Village, Renfrewshire, appeared in court charged with fraud in 2007 after walking away almost £100,000 of his clients' cash, though prosecutors later dropped the case. Sources with knowledge of how the company works say they cold-call people from the phone book or businesses from the Yellow Pages website. Staff who were doing the cold-calling say they were working from £10 pay-as-you-go mobiles after the office phones were disconnected. And several staff have complained they were left unpaid then sacked. One former employee came back to confront Kennedy, and the doors at the office overlooking the M8 near Glasgow Airport are now kept locked. One former staff member said: "The scheme targets homeowners who have at least 30 to 40 per cent equity. "The idea is to convince them to remortgage their home to free up some cash, which is used to pay off debts. "If we convince them to remortgage a bit higher and hand over £15,000 for a franchise, then all the better. "The remortgage is done in such a way that your payments do reduce to start with. But when interest rates go up or the fixed term ends, the payments will too." Another source said: "The company hasn't got enough work to pay dozens of franchisees thousands of pounds a month. The only way it can pay out money to franchisees is by getting lots more people to buy franchises. Then they use the money from the new franchise owners to pay the first group, and so on. "That's called a Ponzi scheme. It might work for a while, but will eventually fall in on itself. People should be wary given Kennedy's history." Marian Owen, of consumer website Business Opportunity Watch, said: "The franchise looks very suspicious to me because the profits they promise are so high they sound too good to be true. With a standard franchise, you may make good profits but you have to work hard for it." She also pointed out that the franchise offer sounds more like an investment scheme. Anyone operating an investment scheme must be registered by the FSA. Cost Reduction Services are not. Mrs Owen added: "It seems to me that this is deposit-taking activity, which is in breach of the Financial Services and Markets Act unless you have the appropriate authorisation, such as a banking licence - of which there is no sign." Kennedy did not respond to requests for comment. Staff said he was out of the country. Scott said while he was "not privy" to details of the company's earnings, it was his "understanding" from Kennedy that Cost Reduction Services had enough work to pay franchise holders from business earnings. SELF-STYLED finance expert Kennedy left a string of clients almost £100,000 out of pocket with his dodgy mortgage business six years ago. When Kennedy, left, went bankrupt in 2005, creditors were unable to pursue him because all his assets were in his wife's name. He was later charged with fraud but to the dismay of victims, prosecutors dropped charges against him because of "an insufficiency of evidence". Kennedy lives in exclusive Quarriers Village, near Bridge of Weir, Renfrewshire, in a £375,000 house - which is in his wife's name. SOLICITOR O'Donnell's Glasgow office was raided seven years ago during a gangland money laundering probe. He has been found guilty of misconduct twice and was banned from practising unsupervised for five years from 2009. O'Donnell, 60, right, made his name conducting property transactions but later faced 21 claims for negligence. He was made bankrupt last year. He is being styled by Kennedy as CRS's "court lawyer", sources say. O'Donnell says he has nothing to do with the business - but has previously represented Kennedy in court. MILLER, 49, has been working as a "consultant" for Cost Reduction Services. The ex-bankrupt was struck off as a solicitor in 2005 after forging the signature of his former partner in a Dundee law firm on forms to carry out the administration of a will. Miller, from Strathaven, Lanarkshire, has claimed to be a financial advisor but he is not registered with the Financial Services Authority. Restrictions were placed on him practising unsupervised as a lawyer in 1999 because he had been made bankrupt. The tribunal who struck him off said there there was "no place in the solicitor's profession" for someone like Miller. MACFARLANE, 50, is banned from practising as a lawyer unsupervised until 2012. She was fined £2500 in 2009 by the SSDT for professional misconduct - covering up for her mortgage adviser husband after he stole her client's £24,000 deposit for a home. Sources say she heads up the legal side of the Cost Reduction Services and is the boss in the office apart from Kennedy. When confronted at the Cost Reduction Services HQ, MacFarlane, from Newton Mearns, near Glasgow, denied she was the firm's lawyer. She said her job was to write wills for customers. MacFarlane said: "I can't offer legal advice ... I've no practising certificate. I can't practise as a lawyer." She admitted knowing John O'Donnell and said he had been in the office - a claim he denies. ARCHIE and Joyce Miller ended up los ing £20,000 to Cost Reduction Services boss Stewart Kennedy seven years ago. The couple from East Kilbride, both 72, were forced to work past retirement age to make up the cash they lost. They were cold-called by one of Kennedy's former firms in 2004 and met Kennedy face to face. Like many other families at the time, they were facing a shortfall on endowment policies - savings intended to pay off a mortgage at the end of its term. Kennedy told them they should cash in their policies early, sign them over to him, and he would remove the shortfalls by rearranging their mortgage. They did so - and never saw a penny of their money again. The Millers' loss formed part of a fraud case against Kennedy in 2007. The Crown Office was challenged by their local MSP, then finance minister Andy Kerr, on why the action was later dropped. In a letter to Mr Kerr, solicitor general Frank Mulholland said there was an "insufficiency of evidence". The legal chief went on to say that for a charge of fraud to stick, the Crown had to prove the accused had the "intention to deceive" or the "intention to permanently deprive the victim of the property in question". Yesterday, Archie and Joyce said Kennedy should be avoided at all costs. Archie said: "Given our experience, I would advise people to steer well clear of this man or anything he is involved with. It's frightening to hear he's in business again, especially the detaills about the people who are working with him." Scottish Legal Aid Board Chiefs were told by Law Society to keep report on legal aid scandal lawyer a secret. WORRIED officials at the Law Society of Scotland have ordered bosses at the Scottish Legal Aid Board (SLAB) TO REFUSE Freedom of Information requests for copies of the Law Society’s own, as-yet-unpublished, damning ‘reporter’s report’ on solicitor Niels S Lockhart who, the Sunday Mail newspaper recently revealed stood accused by Legal Aid Chiefs of making “unnecessary & excessive” claims for legal aid, while raking in over £600,000 in legal aid funds paid out of the public purse in over two years. Last Friday, Diary of Injustice published the full Scottish Legal Aid Board report on Niels S Lockhart SCOTTISH LEGAL AID BOARD S31 COMPLAINT REPORT TO THE LAW SOCIETY OF SCOTLAND : NIELS S LOCKHART (pdf)along with a summary of SLAB’s allegations, running to twelve heads of complaint alleging on the part of Mr Lockhart : 1) Excessive attendances, (2) Lack of Progress, (3) Splitting/Repeating Subject Matters, (4) Inappropriate Requests for Increases in Authorised Expenditure, (5) Matters resubmitted under a different guise, (6) Standard Attendance Times, (7) Attendances for Matters Not Related to the Subject Matter of the Case, (8) Unreasonable Charges, (9) Double Charging for Correspondence, (10) Account entries not supported by Client Files, (11) Attempt to Circumvent Statutory Payment Procedure for Property Recovered or Preserved, (12) Continued Failure to act with Due Regard to Economy. After seeking a review of the decision to withhold the Law Society’s report on Lockhart, yet another Legal Aid Board Director was brought in to study the original decision to refuse disclosure of the Law Society’s secret Lockhart report. A solicitor who spoke to Diary of Injustice last week over the Lockhart scandal, said today it was rubbish to suggest the Legal Aid Board needed the permission of the Law Society to publish their own report on SLAB’s complaint. An official with one of Scotland’s consumer organisations agreed the decision by the Scottish Legal Aid Board to withhold the Law Society’s own report on Lockhart was wrong. She continued : “After all we are talking about legal aid which is paid for by public funds and if these allegations made by the Scottish Legal Aid Board against Mr Lockhart were also held to be true by the Law Society’s own investigating solicitor, then it is certainly in the public interest for us to see these reports, a copy of the agreement between SLAB & the Law Society, and question why nothing was done to recover amounts of legal aid paid to Mr Lockhart which SLAB themselves called unnecessary & excessive claims. If this turns out to be as much a failure at the Legal Aid Board as well as the Law Society who apparently both did nothing about allegations involving possible misuse of public money, the public have a right to know”. The Scottish Legal Aid Board have not released a copy of the ‘minute of agreement’, which was apparently drafted up after discussions with the Law Society & the notorious Legal Defence Union, leading to speculation that if they had wanted to, Legal Aid Chiefs could have pursued their allegations against Mr Lockhart to effect some measure of repayment to public funds, however the deal was signed and Mr Lockhart was allowed to quietly ‘remove himself’ from the legal aid register, this after a four year long investigation by the Law Society of Scotland into SLAB’s twelve heads of complaint against Mr Lockhart. Commenting on the Lockhart-Legal Aid scandal, John Lamont MSP, the Scottish Conservative’s Justice Spokesman said : “Legal aid is a vital and valuable resource that rightfully extends proper justice to those who otherwise could not afford it. Any abuse of this system is abhorrent and we must do everything we can to ensure that we identify and punish those who try to commit legal aid fraud." The Scottish Legal Aid Board were approached for comment on the case and were asked several questions. A spokesperson for SLAB issued a general statement on the case, saying : "The Board takes very seriously any cases of abuse or fraud of legal aid, the latter is a matter for the Crown Office. This case did not involve fraud. As a result of the Board's actions in refusing to pay Mr Lockhart's accounts, public funds were protected. In this case the Board was concerned to ensure that Mr Lockhart stopped undertaking legal aid as early as possible. The Board does not have the powers to prevent or stop solicitors from practising civil legal assistance regardless of their behaviour. Such powers correctly rest with the Law Society. However, as a consequence of the Legal Services (Scotland) Act, this power will transfer to the Board from 1 May 2011. Where there is evidence of fraud or abuse of legal aid, the Board will use this new power to take timely and appropriate action. In Mr Lockhart's case, the agreement reached meant that he stopped, for all time, all legal aid work." The Scottish Legal Aid Board were asked if they thought this a proper way to go about protecting public finances from solicitors who are accused of making "unnecessary and excessive" legal aid claims by allowing a solicitor to walk away from such evidence as contained in the report without any repayment to the public purse. SLAB were asked if they would like to comment on the involvement of the Legal Defence Union on behalf of the solicitor, while a claimant who may have been accused of wrongly or fraudulently claiming legal aid could have expected to be charged with a criminal offence. SLAB were asked if they would like to offer any comment on why the Law Society took 4 years to investigate Mr Lockhart and whether SLAB finds this 4 year investigation time span a satisfactory state of affairs. SLAB were asked if they will be reviewing or curtailing the involvement of the LDU to negotiate away any prospect of a solicitor being charged with fraudulent claims of legal aid or being required to repay SLAB for erroneous or fraudulent claims of legal aid in the future. The Law Society of Scotland are rumoured to have demanded a halt to releases of information on legal aid scandals. A legal insider at the Scottish Government today confirmed the Law Society of Scotland were demanding no more releases of documents which may reveal several further secret deals between the Legal Aid Board & the Law Society over legal aid irregularities. The insider alarmingly claimed the collective figures over the years where numerous solicitors are suspected of making the same kinds of “inflated & unnecessary” claims as Mr Lockhart did, may run into MILLIONS OF POUNDS taken from the legal aid budget, funded by taxpayers. 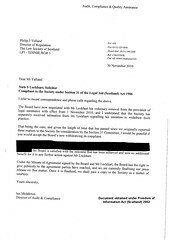 Do you think the public purse was protected by the Scottish Legal Aid Board in the case of Niels S Lockhart who was subject to twelve very serious heads of complaint against his conduct and his legal aid claims, complaints which took the Law Society of Scotland FOUR YEARS to investigate, only to be binned after Legal Aid Chiefs withdrew their complaint when the Legal Defence Union brokered a deal to allow Mr Lockhart to walk away from allegations of excessive legal aid claims ? I don't ! 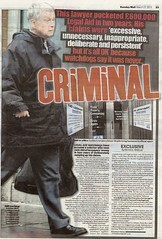 Legal Aid Chiefs accused lawyer Niels Lockhart of excessive claims yet no prosecution or repayment took place. A SECRET REPORT by the Scottish Legal Aid Board (SLAB) into “excessive” claims for legal aid made by Kilmarnock based solicitor Niels S Lockhart who raked in over £600,000 in legal aid claims over two years can now be published, revealing the full extent of SLAB’s accusations against the sole practitioner, the FOUR YEAR WAIT for the Law Society of Scotland to rule on the case and the intervention of the Legal Defence Union who brokered a deal allowing Mr Lockhart to walk away from all accusations over his claims for legal aid. The report by the Scottish Legal Aid Board revealed that, of all firms in Scotland, the sole practitioner firm of NS Lockhart, 71 King Street, Kilmarnock, granted the highest number of advice and assistance applications for "interdict" (392) for the period January-October 2004.The next ranked firm granted 146, while the next ranked Kilmarnock firm granted only 30. However, a key error was made by the Legal Aid Board, who stunningly failed to interview any of Mr Lockhart’s clients despite SLAB’s claims of excessive legal aid claims. A solicitor speaking to Diary of Injustice yesterday branded SLAB’s decision not to interview Mr Lockhart’s clients as “incompetence in the extreme”. However, two months later in October 2010, Mr Lockhart’s legal representative James McCann of the Legal Defence Union approached SLAB with a prospective offer that Mr Lockhart would withdraw fully from providing legal aid if SLAB’s S31 complaint was withdrawn. A Minute of Agreement was drafter and agreed with Niels Lockhart & the Legal Defence Union outlining the voluntary and irrevocable withdrawal by Mr Lockhart and the firm from the provision of all firms of legal assistance (funded by legal aid). The third & final part of this report revealing the reality of secret behind-the-scenes deals with the ‘pillars of regulation’ in Scotland’s legal system, along with comment from the Scottish Legal Aid Board & others, will feature in the next few days, as other cases & investigations have taken priority this week. Scottish Legal Aid Board under the spotlight as solicitor accused of excessive legal aid claims quietly removed from legal aid register. THE SCOTTISH LEGAL AID BOARD (SLAB) & the Law Society of Scotland are facing calls for an inquiry into the way they both deal with alleged cases of legal aid claims abuse after it was revealed in a national newspaper a solicitor who raked in over £600,000 in legal aid claims over two years was allowed to quietly remove himself from the legal aid register after a deal had been struck between his lawyer and the legal aid board to avoid any further proceedings, even though SLAB had made a detailed complaint to the Law Society of Scotland in 2006, a complaint which took the law complaints self regulator a whopping FOUR YEARS to investigate ! 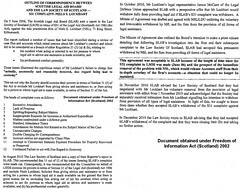 Solicitor Niels S Lockhart was the subject of a Press Release by the Legal Aid Board in mid December 2010, in which SLAB reported Mr Lockhart withdrew voluntarily form the Legal Aid register. However, significant omissions have been punched in the Press Release issued by the Legal Aid Board after a secret report (since quoted in the media) emerged on SLAB’s investigation & dealings with the Law Society of Scotland & the Legal Defence Union concerning Mr Lockhart, with strong indications emerging the public were misled by the terms of the Legal Aid Board’s Press Release over the extent of the SLAB investigation into Mr Lockhart and his subsequent resignation from the legal aid register. The Sunday Mail newspaper has since reported on the case (article below), and a further report including a copy of the actual secret Scottish Legal Aid Board investigation and their statement on its contents along with questions put to the board over their conduct will be featured in an upcoming report on Diary of Injustice later this week. LEGAL AID watchdogs have accused a solicitor who took £600,000 of taxpayers' money in two years of deliberately ramping up his claims. Niels Lockhart, 60, who runs a one-man firm in Kilmarnock, raked in £280,200 in 2004 then £321,400 the following year. After he ignored a warning to curb his claims, the Scottish Legal Aid Board investigated before a probe team concluded that his applications were a systematic attempt to create extra fees. But despite deciding that he routinely made "unnecessary and excessive" claims, SLAB did not call in police. They referred Lockhart to the Law Society who also decided no fraud had taken place. A slab spokesman said: "The matter was not one of fraud and, therefore, not a criminal matter. A Law Society spokeswoman said: "Our powers in this situation relate to considering the solicitor's conduct. It is not for the society to determine whether there has been fraud." Married dad-of-two Lockhart, from Ayr, said: "There was no suggestion of any dishonesty. I voluntarily removed myself. I was going to withdraw anyway. Where did you get this report?"